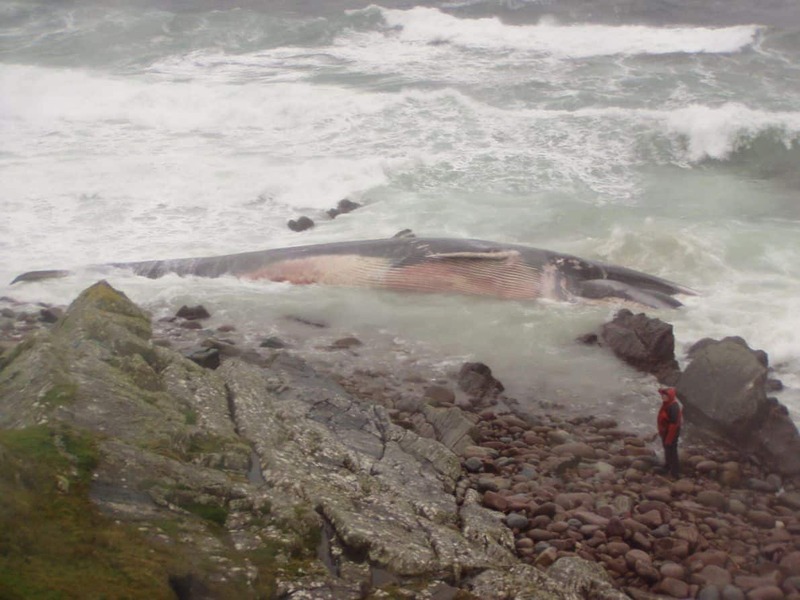 On Tuesday 30th October 2007 a Fin Whale, Balaenoptera physalus, washed up on the rocky shoreline at Raffin, less than two kilometres south of the lighthouse at Stoer in Assynt, West Sutherland. It was a female, measured 19.95m long (over 65 feet) and was estimated to weigh over 50 tonnes. According to Bob Reid from the Wildlife Unit of the Scottish Agricultural College Veterinary Services in Inverness, it had probably died less than 36 hours previously. There had been strong westerly winds the previous few days which is nothing exceptional to this area. A post mortem carried out on site by Bob Reid on 31st October showed the whale to have been a young female in good condition. No information about its diet could be obtained from its stomach content as it was full of sea water. There was however a series of deep groove marks along the lower rear flanks of the animal, 17mm wide, which may have been caused by a metal rope. The bruising was apparently deep into the flesh and was obviously caused prior to death. The pattern of scarring and bruising seems consistent with a metal rope and possibly a knot where it was joined to a lighter rope. There is a strong possibility therefore that the whale died due to drowning caused by entanglement in ropes, probably not far from where the carcass washed up. It may have been from fishing gear or perhaps one of the many deep water creel ropes that occur all along the coast here. The wildlife unit of the SAC Veterinary Services is currently embarked on a study with St Andrews University to look at incidents of Baleen whales becoming entrapped in fishing gear and ropes. There have been only seven strandings of Fin whale in Scotland since 1992 (see table 1) making this a significant finding. They have all been exclusively along the north and west coast. According to the Natural History Museum in London, there have been only seven records of Fin whales being washed up anywhere in UK waters in the whole of the previous twenty four years (between 1966-1990). This compares to 54 Minke whales and 374 Long-finned pilot whales in the same period. Whether this means Fin Whales are becoming more common in our shores it is impossible to tell. This Fin whale stranding means that in West Sutherland since 1993 there have been 22 cetaceans washed up on our shores of eleven different species that have come to the attention of the Highland Council Rangers. The Fin whale was obviously the largest.